Lesson number 2 - wing clipping. Given that the first lesson was that hens can fly, its hardly surprising that the second lesson is around wing clipping. As both hens had escaped the first day we had them we almost immediately read up on wing clipping. Some people were completely anti wing clipping and then I read a few articles that said it was only right to clip wings if you want to give the hens any quality of life. Quality of life in the case of my hens would mean not having to live in a cage all the time yet with no danger of being run over by a car or getting into the hands of a local take-away owner. I can understand how people with loads of land in the country might not clip wings but as posted by Michael Kelly wing clipping wont stop them from getting eaten by foxes and nor would a jetpack but it will keep them safe from what might be outside the garden. All this makes it sound like I did the clipping, which I didnt. There are three chickens in this house and I am possibly the biggest. I was left to hold the torch while my two male assistants did the job. A torch? Well lesson 3 would be that hens dont like the dark. As a result to cause the least possible stress to ourselves mostly and the hens we did the job undercover of darkness (with a torch). I held the torch and the roof of the house while assistant 1 removed one hen at a time and assistant 2 chopped the primary feathers on one wing. The hens didnt mind whatsoever and Im pretty sure it didnt hurt as there was no complaining whatsoever. 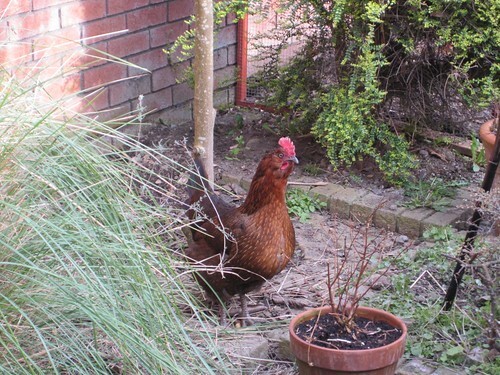 A few days later we let them out for the first time to roam the garden. They were a bit tentative at first and then the big mad one came out and did a poo to show the way for young hen. After that the two of them were hunky dory. In the last 2 days they have scared cats away, pecked at the window to try and get in, fought over snails and generally caused much amusement to all. 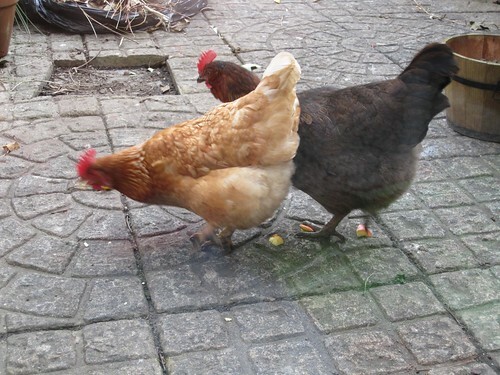 They are slowly getting used to us wandering around the garden to the point that they were even wandering down to have a look at the upgrades to the coop yesterday. It might be that they are a bit more relaxed about us and their new surroundings (they knew where to go to bed last night without any prompting) but its so nice to have them roaming free. More hen updates to come along with answers to some questions I got by email about keeping hens. My new girls have just arrived and since Im using electric netting/fencing ,which is only a meter high, I too will have the joy of clipping their wings. Thanks for the drawing. Thanks for that - we want to keep our chooks more contained so they don't get into our veg garden, which is their favourite spot for a snack.